"The Bible...is the one supreme source of revelation of the meaning of life, the nature of God and spiritual nature and needs of men. It is the only guide of life which really leads the spirit in the way of peace and salvation. America was born a Christian nation." "The liberty, prosperity, and the happiness of our country will always be the object of my most fervent prayers to the Supreme Author of All Good." "Before any man can be considered as a member of civil society, he must be considered as a subject of the Governor of the Universe. And to the same Divine Author of every good and perfect gift [James 1:17] we are indebted for all those privileges and advantages, religious as well as civil, which are so richly enjoyed in this favored land." 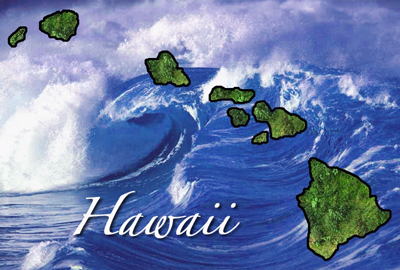 Origin of Name: The islands may have been named by Hawaii Loa, their traditional discoverer. Or after Hawaii or Hawaiki, the traditional home of the Polynesians. 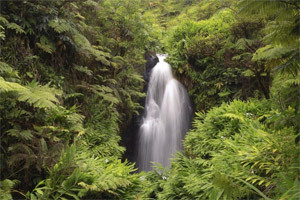 State Forests: 19 • State Parks: 52 State Song: “Hawaii Ponoi"
to find out more about them and to hear the sounds they make. Hawaii, 2,397 miles west-southwest of San Francisco, is a 1,523-mile chain of islets and eight main islands—Hawaii, Kahoolawe, Maui, Lanai, Molokai, Oahu, Kauai, and Niihau. Hawaii is the only U.S. state whose land area is increasing (from volcanic eruptions). Hawaii is the most isolated population center on the face of the earth. 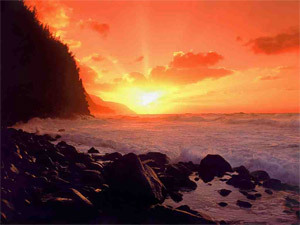 Hawaii is 2,390 miles from California; 3,850 miles from Japan. 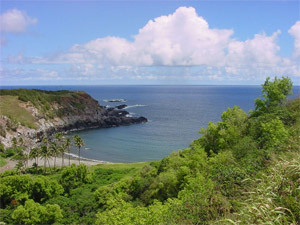 Hawaii has the highest population density in the United States. More than one-third of the world's commercial supply of pineapples comes from Hawaii. It is the only state that grows coffee. 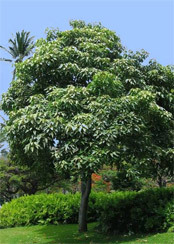 Hawaii is also a producer of cane sugar and macadamia nuts. 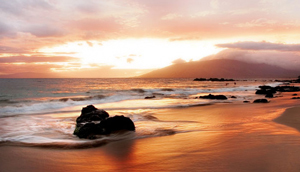 Hawaii has its own time zone (Hawaiian Standard Time.) The time runs two hours behind Pacific Standard Time. They do not observe Daylight Savings Time. 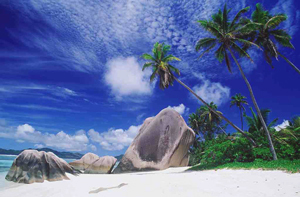 The highest recorded temperature is 100 degrees. Temperatures hover near 90 in August and September. Temperatures in December or January hover around 75 degrees. 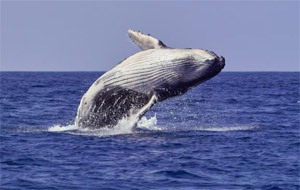 The ocean temperature varies from about 72 degrees in the winter to around 82 degrees in the summer. 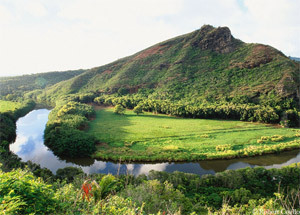 The island of O'ahu is 44 miles long by 25 miles wide. Mount Ka’ala is the highest point on Oahu, rising 4,020 feet above sea level. Mount Ka’ala is the highest point on Oahu, rising 4,020 feet above sea level. Honolulu is the nation's 11th largest metropolitan area. Iolani Palace in the heart of downtown Honolulu is the only royal palace in the United States. Electric lights illuminated Iolani Palace four years before the White house had them. 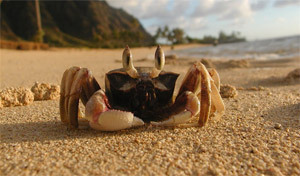 Hawaii has a wealth of native species. Many of them are endemic, that is, found nowhere else in the world. Hawaiian monk seals are one of only two mammals that are endemic to Hawaii. 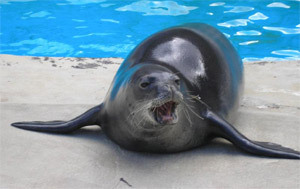 Adult seals weigh 400 to 600 pounds and feed on fish, squid, and crustaceans. 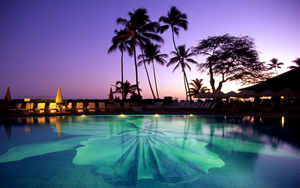 The Hawaiian alphabet consists of only twelve letters. The five vowels are A,E, I, O,U. And the seven consonants are H,K,L,M,N,P,W. Hawaiians' life expectancy for males is 75 years, for females 80 -- the highest in the U.S.
Oahu is home to the world’s largest wind generator. The windmill is located on the top of a 20-story tower. It has two blades, each measuring 400 feet (122 m) in length. 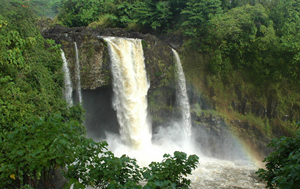 The Big Island of Hawaii is the worldwide leader in harvesting macadamia nuts and orchids. 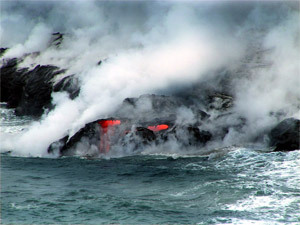 Kilauea volcano on the Big Island is the largest and most active volcano in the world. The Northwestern Hawaiian Islands are home to more than 7,000 marine species, a quarter of which are found nowhere else in the world. Ethnic Roots of Hawaiians: 21.9% Caucasian, 20.6% Hawaiian/part Hawaiian, 19.4% mixed (non-Hawaiian), 18.2% Japanese, 14% Filipino. Chinese, Korean, Samoan and African make up less than 4% of the population. Religion in Hawaii: 63% Christian (39% Protestant • 24% Catholic), 18% Agnostic, 9% Buddhist, 5% LDS, and 5% other. Father Damien dedicated his life in service to the lepers of Molokai. A full size statue of Fr. Damien stands in front of the Hawaii State Legislature. In 1985, he was beatified towards sainthood by Pope John Paul II. In 2005, Father Damien was chosen as the Greatest Belgian of all time by the Flemish public broadcasting service, VRT.